Great book for Middle-Grade aged readers, but not suited to adult readers without the glow of nostalgia. This review needs 2 parts, because there is my experience of reading it, and my review of it for readers it was intended for. 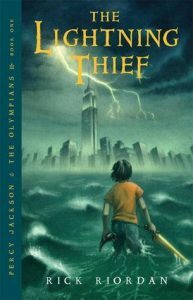 The Lightning Thief is a brilliant book for young readers. The protagonist, Percy/Perseus Jackson is 12, has ADHD and dyslexia and is always getting into trouble. There just aren’t enough characters like that, that kids who might be in similar situations (or have friends who are) can read about and see themselves as a hero. The descriptions of living with dyslexia are accurate and thoughtfully woven into the plot. Percy has his friends help him out when he needs it, and isn’t too hard on himself when he can’t figure something out or read a particular piece of text. There are also age appropriate references to domestic violence, which I felt were dealt with quite well. The overall message is around helping others, and allowing or encouraging them to help themselves. Just because you can be a hero doesn’t mean you always have to, because sometimes giving someone you care about the strength to overcome their own problems is more rewarding. There is also a really strong theme of friendship, with Grover, Annabeth and Percy working together to solve problems. Though this might seem like lots of ‘lessons’ it’s definitely not presented in that way. The dialogue is easy to read, there is plenty of humour, and all the references to mythology are explained in a way that kids will never realise they are getting a thorough lesson in ancient Greek myths. I’ll admit I was expecting a lot from the start of this series. It seems to be as equally beloved as Harry Potter, which gave me the motivation I needed to give it a try. Overall the experience was a bit disappointing. I found the plot painfully predictable and the writing style repetitive. The setting of Greek mythology transplanted to the US grated and many of the reference felt shoe-horned. I don’t think listening to the audiobook version helped, as the narrator wasn’t particularly skilled and his pacing frustrated me. If I had read this as a child and was rereading this series with the glow of nostalgia and knowledge of how the characters would develop I would probably have a very different view. As it stands I found all the characters, aside from Percy, were really lacking in any kind of complexity or development. Annabeth came closest, but even she seemed really inconsistent in her characterization. All the characters who were meant to be children also seemed absurdly mature for their ages, especially having recently been travelling with a 12 year old. Overall I wasn’t hugely impressed with this start to the series, but I will give a few more books from it a try. I know the Harry Potter series gets off to a slow start for the first 2 books, so I think this deserves at least that until a make a final assessment.